Realtime Gaming launched a new wrestling-theme slot game last week called Lucha Libre. South Africa’s Springbok Casino is giving a casino bonus up to R1500 to anyone that wants to take a spin on the new game. The Lucha Libre Casino Bonus, 150% up to R1500, is available until April 30th. “If you’ve ever had a good laugh over the antics of television wrestling stars like Hulk Hogan then you’ll love Taco Malo and Guacamolio in this game!” said Springbok manager Daniel van Wyk. Lucha Libre has grouped wilds and a bonus feature triggered by Scatters. Wrestlers are wild and either double prizes or jump onto at least one other reel for additional winning paylines. The Mask scatter symbol starts the Mask of Doom bonus feature where players can hold reels with Scatters in them. We usually have to wait for a new game to be available in the mobile casino but that could be changing. This is the first time that a new RTG game has been launched simultaneously in the online and mobile casino. 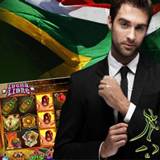 South Africa’s Springbok Casino now has 27 games (slots, Keno and Blackjack) in its mobile casino.